Title: Shoot-Out In Central Park! 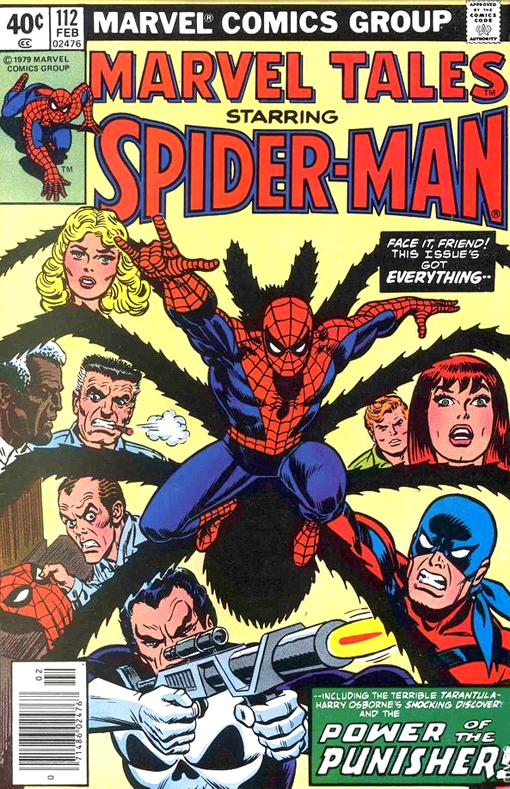 Synopsis: Marvel Tales #112 reprints Amazing Spider-Man #135 (August 1974). Continued from last issue, the Punisher spars with Spider-Man, thinking that he's in league with the hijackers of the ship. As the Tarantula and his minions escape, the Punisher realizes that he was wrong about Spider-Man and suggests a meeting later that night. Changing back to his identity as Peter Parker, our hero pretends that he was knocked overboard and needed to be rescued. After Peter returns home to shower, his room mate Harry Osborn sneaks in and finds the Wall Crawler's costume, fueling his deranged suspicion and anger. Later that night, Spider-Man meets up at the museum at Fort Tryon and the two proceed to the Tarantula's hideout where they defeat the villain and his men. The issue ends with Harry Osborne at the Oscorp warehouse where his father was killed, plotting his vengeance on Spider-Man.